In the past year, both national holidays commemorating Cameroon's foundations - October 2017's independence anniversary and May 2018's National Day salute to the unitary state system - were marred by violence between the Francophone government and Anglophone secessionists. The secessionists, who formally declared independence for the "Republic of Ambazonia" in October, have struggled to establish a sovereign state comprising the bilingual country's primarily English-speaking Northwest and Southwest Regions. Now, they are resorting to any means necessary - including violence - to achieve their goals. Issues of minority recognition in Cameroon are rooted in the country's post-colonial unification and long-standing tradition of sidelining the English-speaking minority's language and customs. When the movement's current manifestation emerged in late 2016, it did so through peaceful protests calling for a return to Anglophone-Francophone federalism. However, because of the government's violent reaction to such demonstrations, the movement morphed into its present form. It is now more mainstream in reach, but more extreme in strategy. The shift in the movement's ultimate goal--from power-sharing to secession--has subsequently changed its methodology. Now, life in the Northwest and Southwest Regions of Cameroon is characterized by fear as protests, curfews, security patrols, arrests, abductions, and killings occur daily. While the rebels' strategy has become increasingly violent, the central government is equally responsible for the many deaths and disappearances reported over the past six months. Violence around Cameroon's May National Day celebrations is a microcosm of the larger conflict. Expectedly, hostility stained the commemoration of the 46th anniversary of the country's transition from a federal system--which equalized the French and English language, legal, and educational systems--to the Francophone-based unitary state system, approved by national referendum in 1972. 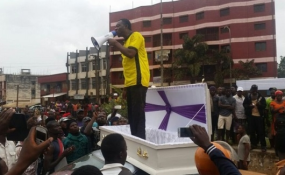 While Francophones celebrated the May 20 holiday in Yaoundé with a parade and speeches, Anglophone secessionists boycotted festivities, kidnapped local leaders, and murdered several police officers. Then, later in the week, several dozen so-called "terrorists" were killed by security forces in the Northwest Region. This retaliation not only added to the number of casualties, but also signaled that the government is willing to strike back. Reports since October 2017 indicate that a high number of civilians and secessionists--allegedly over one hundred-- have died in clashes with government troops, in addition to the hundreds arrested. Meanwhile, rebels have reportedly killed at least forty government personnel, and have abducted, held, and tortured scores of local leaders, teachers, government supporters, and security agents. The use of violent tactics by marginalized populations agitating for political rights and representation showcases a systemic problem within authoritarian countries. While many similar movements begin peacefully, brutal governmental reactions often follow. In many cases, governmental overreaction signals that peaceful mobilization will be fruitless and provides an opening for a movement's more radical members. In Cameroon, peaceful protests in late 2016 were met with repression, resulting in the existing situation and placing responsibility for the violence squarely on the shoulders of the central government. The government's violent reaction--coupled with its unwillingness to negotiate with Anglophone leaders or compromise its current policies--forced a subset of the Anglophone movement to conclude that no recourse was available except violence of their own. While it is unclear how representative these violent groups are of the larger Anglophone movement, it is dangerous for anyone in an opposition movement to resort to violence; such a strategy ultimately provides repressive governments an opening to label the entire movement as "terrorists" or "dissidents" and to ignore those peacefully advocating for their rights. As a result, while there are many Anglophones who sympathize with the movement's original intent, the violence has created a situation in which citizens are forced to choose: support the Cameroonian state and continue to be marginalized, or support the "Ambazonians" and risk being deemed a terrorist. The high levels of displacement suggest that picking sides is more dangerous than fleeing. Whether it evolves into a full scale civil war and humanitarian disaster or not, the current conflict triggers questions regarding the legitimacy of the Anglophone movement. Before the movement resorted to violence, the Francophone government's crackdown on Anglophone protesters was viewed as authoritarian repression against innocent civilians seeking a break from long-standing marginalization. Although peaceful methods did not help them to accomplish their goals, the Anglophone movement's acceptance of--and explicit call for--violence as a tactic in their struggle against the state may delegitimize their objectives as it displaces and harms innocent civilians. Furthermore, the group's indiscriminate violence may concurrently provide security forces with an excuse to use similar tactics and legitimize the state's classification of the secessionists as terrorists. Despite the Anglophone crisis' steady intensification over the past eight months, the international community has mostly ignored the growing violence and the government's role perpetuating the situation. While this may be due, in part, to the myriad humanitarian crises and conflicts in the region, the fact that Cameroon--which has been hailed as one of Central Africa's beacons of stability despite its authoritarian government and is an important partner in the regional war on terror--is facing growing instability as the Anglophone crisis continues to escalate, is not one that many international partners are ready to acknowledge. However, in recent weeks, the United States has stepped up, calling for an end to the violence. Following the US Department of State's Human Rights report's criticism of abuses in Cameroon, the US Embassy has been more vocal. Prior to Cameroon's National Day celebrations, US Ambassador Peter Barlerin met with President Paul Biya and explicitly condemned the actions of both sides. While Barlerin denounced the "murders of gendarmes, kidnapping of government officials, and burning of schools" by Anglophone secessionists, he also publicly accused the government of "targeted killings, detentions without access to legal support, family, or the Red Cross, and burning and looting of villages"--an important step in persuading Biya to consider the Anglophone case and reminding the international community that the Cameroonian government is ultimately at fault for the ongoing violence. Again calling for a dialogue, Barlerin noted that Biya has an opportunity to cement his legacy prior to the upcoming October 2018 elections by re-establishing peace in the country. While the outcome is near certain--Biya will again extend his thirty-five-year hold on power--the elections, which will occur just over a year after "Ambazonia's" declaration of independence, offer an opportunity for international partners to pressure the government and the secessionists to negotiate peace. In using the leverage gained by supporting regional security efforts, including the fight against Boko Haram, Cameroon's international partners can persuade the government to end the violence against Anglophones and to seek a long-term solution to their marginalization. Further, the elections provide a national and international platform for the Anglophone movement to amplify its voice and concerns, and to seek the recognition and representation it desires through non-violent means.